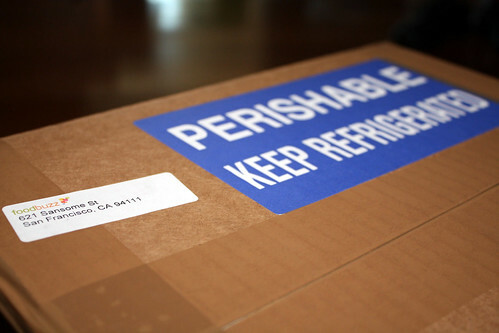 A few weeks ago, the mailman brought a big box right up to my door. 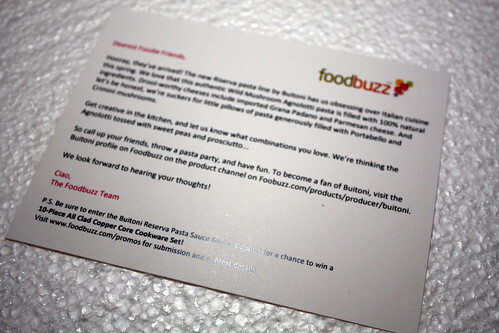 I was momentarily confused by the PERISHABLE sticker until I saw address label, and then I remembered the wonderful people at FoodBuzz had offered to send me some Buitoni fresh pasta to sample. I put the box down and immediately ripped into it so I could get it straight into the fridge. On top of the contents was a nice little note from FoodBuzz. 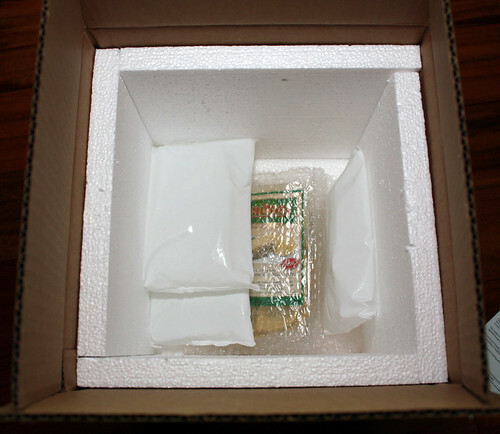 This seemed like a lot of packaging just for one little container of pasta. But I don’t know how much space was necessary to ensure that the ravioli was kept cold, so I’ll give them all the benefit of the doubt there. I lifted out the pasta and set it on the counter. Wild Mushroom Agnolotti…that sounded pretty good, although portobello and crimini mushrooms, beyond being two different sizes of exactly the same mushroom, are not varieties of mushrooms that scream “wild” to me. 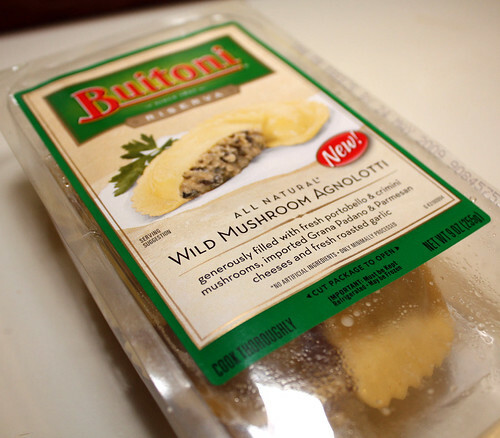 But I do like crimini mushrooms, the cheeses sounded like good choices and the pasta looked to be pretty high quality, so I was still looking forward to giving these a shot. I meant to enter the Buitoni recipe contest with them, but after the deadline passed I figured we should just have them for dinner with garlic bread and a nice, fresh salad. The phrase “journalistic integrity” has a certain allure, doesn’t it? It makes me want to say I didn’t like the pasta, just because I got it for free. And so it is with great hesitation that I tell you that these were absolutely the best prepackaged ravioli I’ve ever had, and possibly better than anything I’ve ever had in a restaurant. I could’ve easily eaten the entire package myself, and then gone back for seconds. The filling was flavorful enough to stand up to the sauce, and the pasta had the backbone of Chris’ latest batch of fresh pasta, when he tried using semolina flour for the first time to really amazing results. There was just something so present about the flavor and the texture of the filling that lingers in my mind, something that’s missing in most ravioli in my experience. Oh great, I want more right now just writing about it. I have to figure out where they sell it in our area…or make something similar on my own. 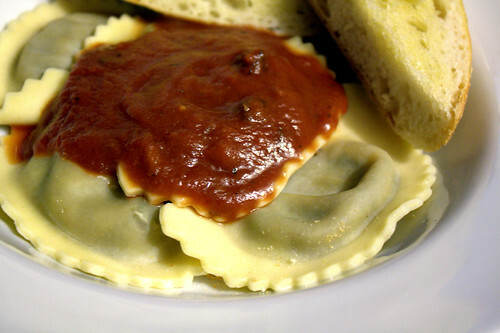 But ravioli are one of those things that I always think take more effort than they really do and thus never set out to make, so I don’t mind splurging on the prepared ones at the store occasionally. 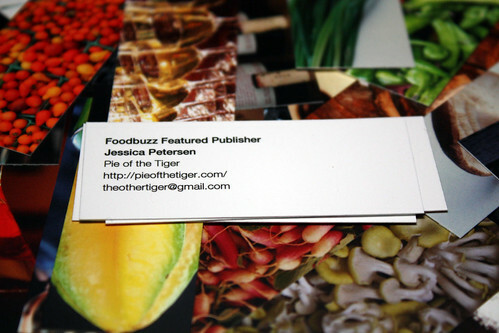 As long as I’m writing about my first food sample from FoodBuzz, I might as well show off the Moo Cards they got for me. I love everything about this company. 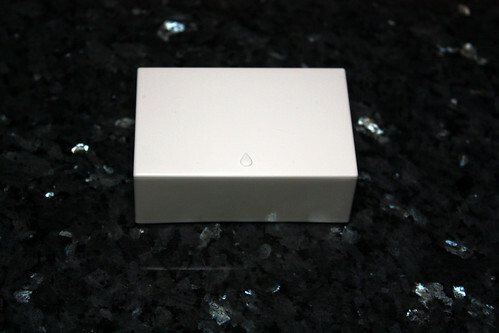 The packaging is really cute and clever, and reading their company blog shows that there are some cool and creative people behind the product. The cards are half the size of a regular business card, which makes them great to hand out when people seem interested in your blog. I like that they’re a little less formal, but at the same time they’re nice and thick and vivid and glossy, so they have a professional look to them as well. The cool thing about them is that you can have a different photo on the back of every card. FoodBuzz chose a bunch of bright and colorful food photos, and they’re really eye-catching. 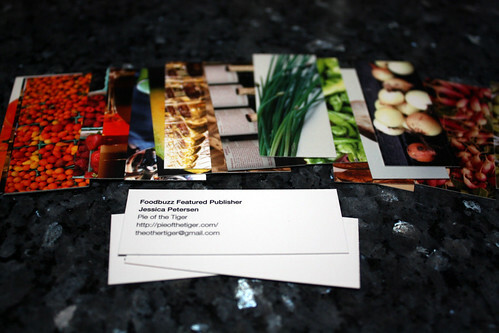 I’m working on a set of images now to get some cards to hand out at writing conferences, but I’ll probably also end up ordering another set for this here blog, because as cool as these FoodBuzz ones are, I’d like to have my own photography on the back of mine. I always feel like I have to explain that the photos aren’t my own! Long story short? FoodBuzz knows how to treat their Featured Publishers right! I was already enjoying being part of the program before the free stuff showed up, but free stuff never hurts. Thanks! 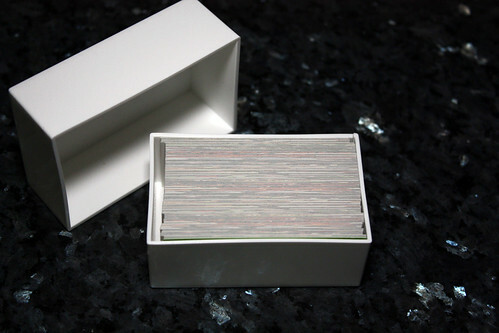 One of these days, I’ll remember to order some Moo cards. Heh. I like them a lot. I think the only bad thing about them is that I want to have a different photo on the back of every one, just because I can, but that’s going to take forever to arrange. 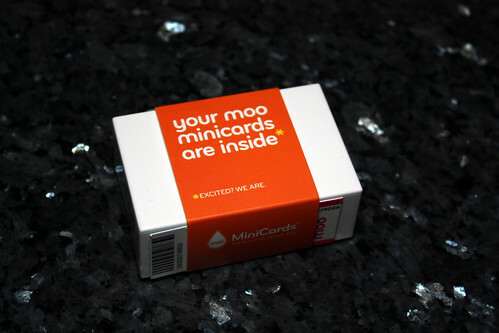 Hello – I hope you don’t mind me commenting, I work for MOO, and I saw your post pop up in my feed reader. I usually shut up and let people get on with things but I just wanted to say, you have *the* best url / site name. There at least 5 people in the office who’d’ve registered it themselves if they’d thought of it first! (We’re also glad you like your cards, of course). I tried these ravioli today because they caught my eye in the store. Didn’t expect much but was BLOWN AWAY. They are delish!